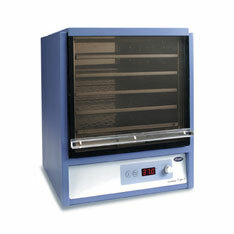 Specially designed for use with microtitre plates, which can be difficult to incubate. In conventional incubators, when 4 or more plates are placed on a shelf, they block the air circulation, which can seriously impair temperature distribution. The Stuart SI19 Incubator overcomes this problem with forced air circulation, which blows preheated air across the shelves rather than just through them. Microtitre plates are also prone to drying out during incubation. The SI19 overcomes this with a water tray to increase the humidity within the chamber. The bright LED display indicates temperature and the encoder control allows rapid and accurate temperature setting. An integral over-temperature protection system automatically tracks the set temperature and controls the heater in the event of a fault. Error codes are displayed if a fault has occurred or if the set temperature has been interrupted. An acrylic upwards opening door provides excellent access to the interior. The stainless steel chamber features 4 shelves each accommodating 6 plates (or 12 stacked in 2 layers). Shelves are captive and slide out for easy loading.